We have undergone a major refurbishment and now operate a range of rooms, from dormitory rooms with bunk beds through to private en suite rooms. Stay with us at the St James Hostel in a building combining original Victorian architecture with modern amenities. We are a hostel with new beds, mattresses, furniture, bathrooms and loads of communal space. Well-maintained accommodations include an exclusive ladies-only dorm room and showers. Enjoy our free breakfast, consisting of eggs, pancakes and syrup, fruity drinks, tea and coffee, four types of breakfast cereals and toast with spreads (jam and peanut butter). You can also use our communal kitchen to cook meals outside of breakfast time and can help yourself to complimentary tea and coffee any time in our two dining zones. Spend time at our common spaces such as the large patio garden and lounge with 50-inch HD TV. We offer free and fast 300Mb Wi-Fi available throughout the property. Our ideal Central London location (Zone 1, Earls Court) places you within half a mile of Royal Parks such as Kensington Gardens and Hyde Park. Within a 20-minute walk from the hostel are the Victoria and Albert Museum and the Natural History Museum. Madame Tussauds, Harrods and Buckingham Palace are a 15-minute train ride away. Earls Court train station is 5 minutes walk away, while Heathrow Airport and London City Airport are a 45-minute and a 50-minute train ride away respectively. 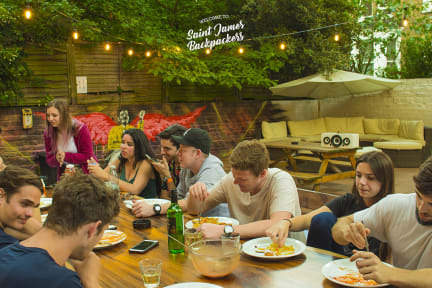 More reasons to stay at Saint James Backpackers? - There is a 48-hour cancellation policy on all reservations. Any night that isn't cancelled with at least 48 hours notice will not be refunded. - A £10 key deposit is payable at check-in, which is returned on return of the key at check-out. - Minimum age to stay in a dorm is 5. - Please note that there are limited spaces for dinner; you must sign up at reception each day before 16:00, signup is done on a first come first serve bases. If you cannot make it here in time please just call us and request to be put on the list.